William Morrow Paperbacks, 9780061931437, 304pp. The critically acclaimed author of Good-bye and Amen, Leeway Cottage, and More Than You Know, Beth Gutcheon returns with Gossip, a sharply perceptive and emotionally resonant novel about the power of knowing things about others, the consequences of rumor, and the unexpected price of friendship. 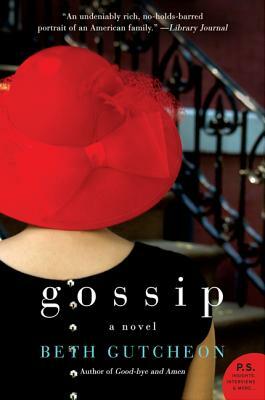 A story set among the rich, famous, and well-dressed of Manhattan’s Upper East Side, Gossip is a bravura display of this exceptional author’s breathtaking talents, addressing important themes of motherhood, friendship, and fidelity. Every reader who admires the strong, character-driven women’s fiction of Sue Miller, Alice Hoffman, Elizabeth Berg, and Kaye Gibbons should lend an ear to Beth Gutcheon’s Gossip.